Bounce TV to Pay Tribute to Muhammad Ali with THE GREATEST (1977) June 6 at 10:00 P.M. (ET), 9:00 P.M. 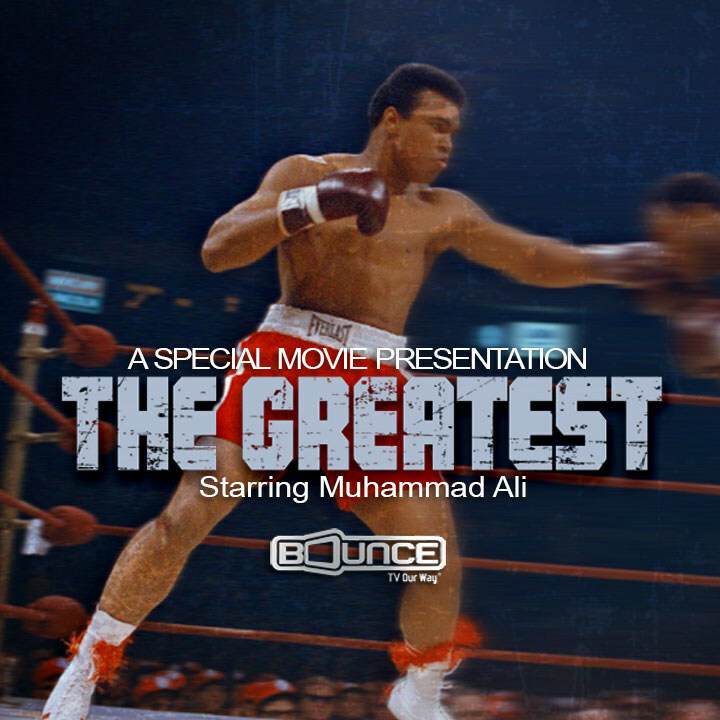 Bounce TV will celebrate the incredible life of Muhammad Ali, the global icon who passed away June 3 at the age of 74, with a special presentation of "The Greatest," the 1977 motion picture in which Ali stars as himself, on June 6 at 10:00 p.m. Eastern Time, 9:00 p.m.Central. The Greatest is a dramatization of Ali's life and starts with his rise to fame winning the heavyweight gold medal at the 1960 Olympic Games, when he was known as Cassius Clay. He then stuns Sonny Liston to become heavyweight champion of the world and soon after converts to Islam and changes his name. When he is suddenly classified 1A by the Draft Board that earlier rejected him, Ali refuses the draft on religious grounds, which leads to the stripping of his title. Embarking on -- and ultimately winning -- a nearly four-year long court battle, Ali then returns to the ring and takes part in what many consider some of the greatest fights of all time. Against all odds, he defeats George Foreman in the legendary "Rumble in the Jungle" to win back the heavyweight title. The Greatest was based on a book written by Ali and others and the boxing footage is largely from the actual fights. The film includes the song "The Greatest Love of All," written for the movie and performed by George Benson, it was later remade by Whitney Houston. Bounce TV is the fastest-growing African-American (AA) network on television and airs on the broadcast signals of local television stations and corresponding cable carriage. The network features a programming mix of original and off-network series, theatrical motion pictures, specials, live sports and more. Among the founders of Bounce TV are iconic American figures Martin Luther King, III and Ambassador Andrew Young.